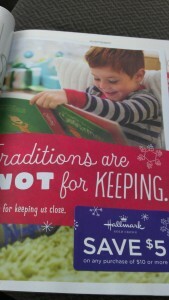 New $5 Off Hallmark Coupon in Martha Stewart Living Magazine | A Savings WOW! We just received our December 2011 issue of Martha Stewart Living in the mail today and found some fun coupons in there. If you aren’t already a subscriber to Martha Stewart Living magazine, you can find it at your nearest retailer. Have you found any good coupons in magazines you’ve been reading lately? Get your Martha Stewart Living subscription.